Who knew one snack could have so many names?! 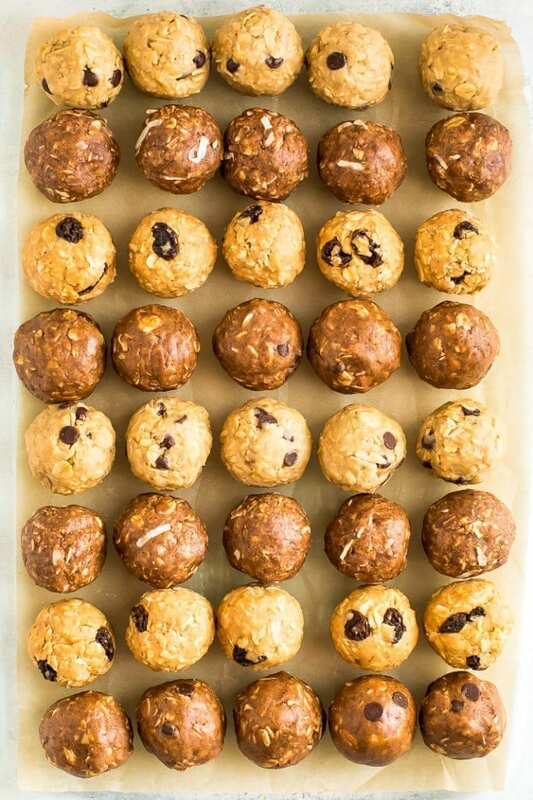 Protein balls, energy bites, just “balls”. . . I’m sure there are even more out there. No matter what you call them, one thing is for sure: they are one of the best snacks to have on hand for easy, healthy snacking! 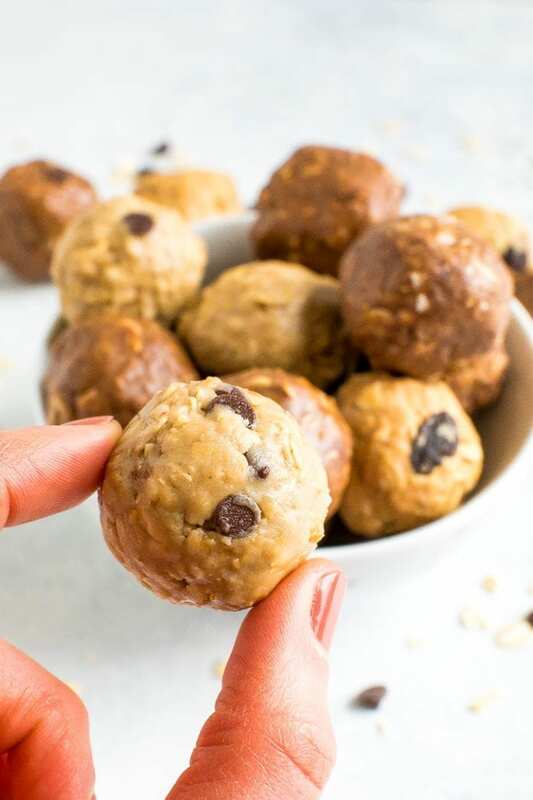 I know some people love their store-bought protein bars (and I have a few favs too) but I honestly really like making homemade protein balls because I can control what ingredients go into the mix AND they’re way cheaper. Plus, coming up with the different flavor combinations is so fun! One thing I’ve noticed is that a lot of protein ball recipes call for medjool dates and a food processor. 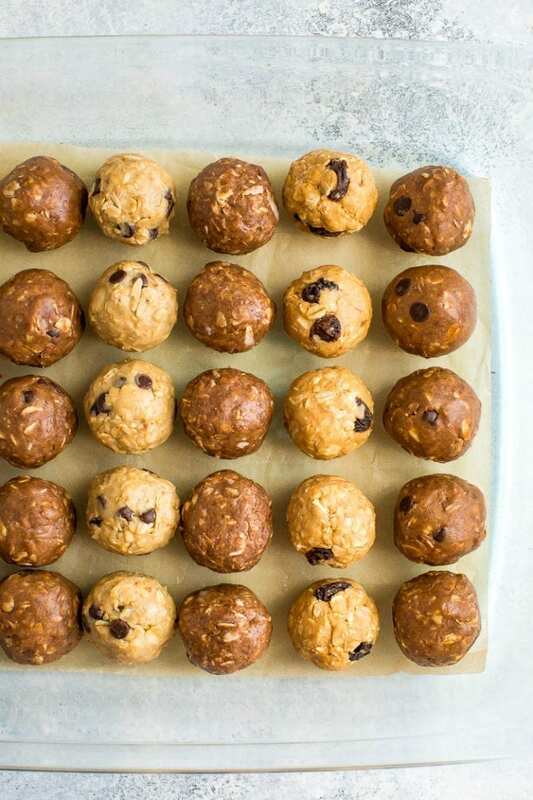 I personally have a TON of recipes that fit this bill – like my Peanut Butter Cookie Dough Protein Balls, Homemade Larabars, Pumpkin Pie Larabar Balls, Blueberry Muffin Larabar Balls, etc. 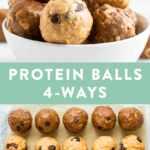 That said, I know not everyone has a food processor so I’m excited to share four different protein ball recipes that you can make without a food processor and without dates! The cool part about this recipe is that you can use the same basic formula to create FOUR different recipes — just by switching up a couple different ingredients you have a brand new flavor! 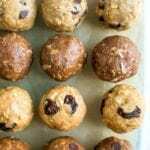 Old-fashioned rolled oats – I always use rolled oats for protein balls because during processing they get steamed and flattened/rolled. This makes the texture way better for no bake recipes! Nut butter – My one tip for nut butter is to make sure it’s drippy! It can be hard to mix when you have a more “solid” or “dry” nut butter, so I recommend finding a runny nut butter. You can use any nut butter you want for the base . . . even a seed butter like sunflower butter or tahini if you’re allergic to nuts. Honey – I add a hint of sweetener to my base because, in my opinion, it is the key to balanced flavor! 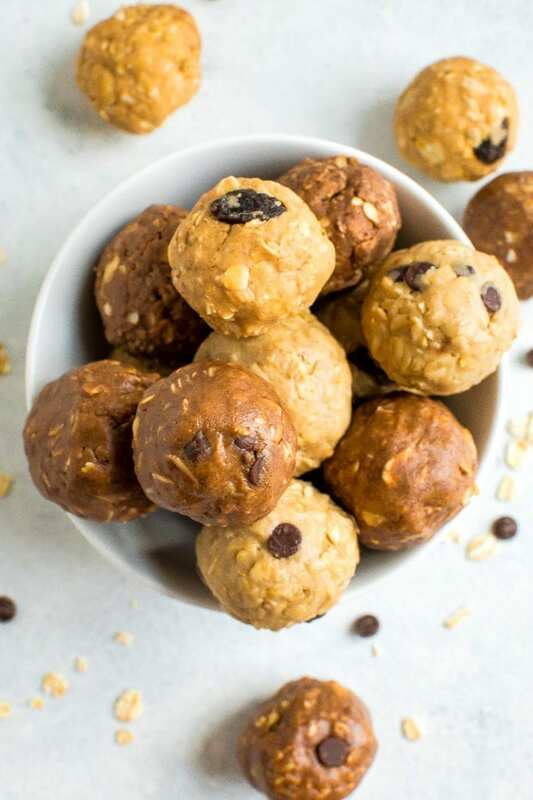 Protein powder – For these protein balls, I’m using a plant-based, organic protein powder. This obviously majorly increases the protein content, which I’m a huge fan of, but it also brings in some fun flavors like vanilla or chocolate and a little sweetness to the mix. That’s it! That’s your base recipe. I like to add in fun mix-ins to make the flavors really unique, and I’ve included four simple recipes below. Try these first and when you feel comfortable mixing on your own, go for it and get creative! I love to make a batch of these on the weekend so that I have grab-n-go snacks throughout the week. 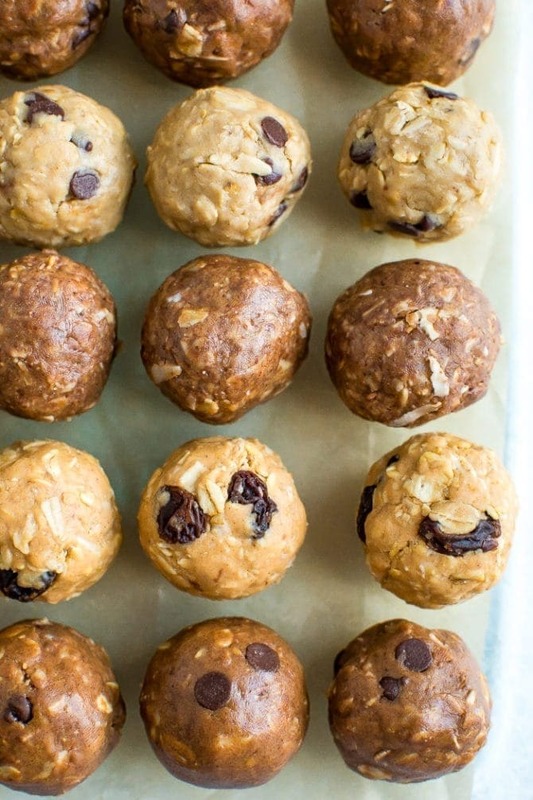 They’re also perfect for a pre or post-workout snack (or even dessert). I usually eat two a time! 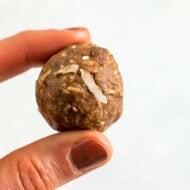 If you try any of these no bake protein balls, please be sure to leave a comment and star rating letting me know how they turn out in the comment section below. Your feedback is so helpful for the EBF team and other EBF readers who are thinking about trying the recipe. 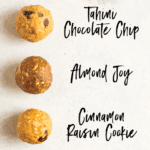 Want to see full recipes for some of my favorite energy balls? Interested in your review of the plant-based protein powder and why you love it so much. I’ve tried a few different plant-based powders and certainly can tell that some are better than others. Our favorite at the moment is a Whole Foods brand after trying Vega and Raw but we just ran out so I’m open to trying another! Can I leave out the oats or possibly replace them with coconut flour? I am a bariatric patient and do not consume oats or regular flour..etc. I think I will try this with coconut or Chickpea flour. If I do, I’ll let you know how it turns out! I am on my second attempt to make the chocolate peanut butter (using almond butter)…they are completely crumbly. The first time I put too much protein powder. Now I’ve put less than called for and they are falling apart. Any help would be appreciated! Are you using natural almond butter and are you at the bottom of your jar? I’ve found that almond butter tends to dry out quickly and can get crumbly towards the end of the jar. Another issue could be that you need to keep stirring or use your hands to combine the mixture. It can seem a little try at first but it will come together. If they’re still too dry, I recommend adding a bit more honey, more almond butter or even a splash of almond milk to help them bind and form together. Hi Brittany. As I am doing Weight Watchers I made some adjustments to these great recipes so as to keep the Smart Points down. I used prepared PB2 in place of the peanut butter and used plain Greek yogurt to help hold them together and add a bit more protein. I omitted the protein powder as I have not found one that is free of Stevia as I just don’t like the after taste. In addition to the honey I used the Wholesome Zero sugar. My husband loved your recipe!! If you have a protein powder sans Stevia I would love to try it. Do you think I could substitute Bob’s Red Mill 7-minute steel cut oats (golden spurttle)? Hey Anna! 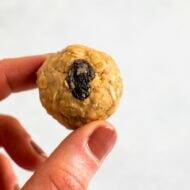 I have never used Bob’s Red Mill 7-minute steel cut oats so I’m not sure the consistency, but overall probably wouldn’t recommend steel cut oats for this recipe because of the hard texture and the fact that these are no-bake balls. Hope this helps. My comment pertains to the German chocolate energy balls in the 6 weeks meal plan that I purchased. I made them last night and was shocked at how delicious they are. I see no reason to buy pre-made protein bars ever again after tasting these little balls of goodness. I did add some honey and cinnamon (not in the recipe) and a bit of extra water. Plus, I used almonds instead of walnuts because they were on hand. I brought them to work and shared and got rave reviews! 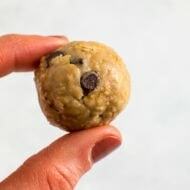 I tried the chocolate chip one and it was delicious and easy! I only had regular peanut butter on hand and I get why I would need the runny type of but butter. I was so excited to make it and knew I had all the ingredients so I just wanted to try it right away plus I have a huge sweet tooth! Thanks! I always have issues with my honey staying liquid so no longer buy liquid honey. Have you tried these with maple syrup instead of honey? Any luck? 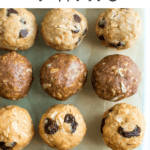 i recently started gyming and needed some protein rich food for enhancing my workout.now i can make my own protein balls through this recipe thanks for sharing this. it will be really helpful. Really great! I did 2 recipes and already want to try mixing other ingredients! These sound yummy!! Would cacao nibs work in place of chocolate chips? Totally! I love cacao nibs.